For updates on WCDGD projects and activity, visit us on facebook! World Champion Disc Golf Design LLC , is a team of enthusiastic disc golfers are working to increase awareness and grow the player base of the game we love. Founded by a three-time world champion and a business savvy player, we bring 40 plus years of experience to each project. Everything you need for an exciting course! We design, install and accessorize your course taking out the guesswork! Click ind out more! Unsure if disc golf is right for your property? Ask us how you can TRY it before you BUY it with our one of a kind Rent-A_Course program. Click for details! Tips from the pros on how to put in a safe, fun disc golf course! Find out how we can help you with your next course, ! Is your course run down? Not getting the play you desire? From new equipment such as baskets and tees, to a complete redesign, we can help! Find out how, ! Our full color signs will make your course shine! Click to see how we can create the right signs for your course! We want to help you promote the sport! We can help organize clinics, grand openings and other events to increase public awareness. Click to find out more! Have a question? Don't hesitate to contact us. 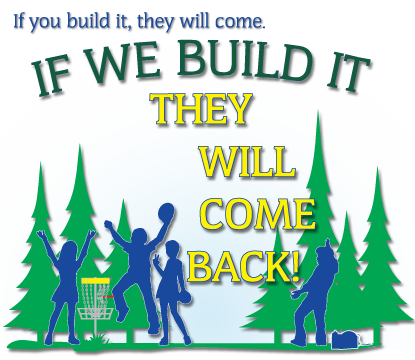 We will be happy to assist you with your disc golf course needs!